Kasco De-Icer Control Panels deliver the performance and reliability you need to get the job done and conserve power during the cold winter months. Each controller is designed to control ONE unit and save money on your power bills. 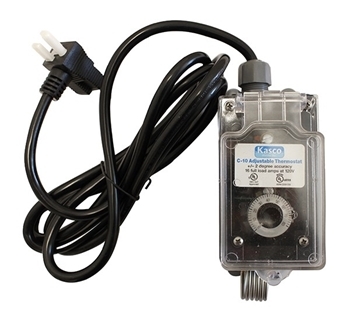 The C-10 thermostat controller is an inexpensive way to control the operation of your de-icer. The C-10 uses an air temperature thermostat to turn the de-icer on when the temperature drops below a set point that you decide. One C-10 controls one 120V de-icer. No one should be in the water while equipment is operating or plugged in. The GFCI protected circuit should always be used. It is essential to test any GFCI monthly to ensure proper operation. Check instructions for procedure. Kasco equipment can come with up to 500′ of power cord. It is important to not add any additional cord; adding additional cord will void warranty, void ETL approval, and could cause nuisance tripping of the GFCI.